Psycho-Cybernetics was written almost 60 years ago and is still as useful today as it was then. 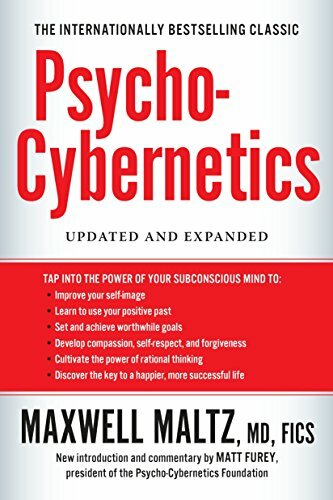 Psycho-Cybernetics: Updated and Expanded by Maxwell Maltz is the only self-development book you need. I got halfway through reading it and started from the beginning again. I realised I should have been taking notes for myself and to also write a review on it. So here we are. Psycho-Cybernetics is a perennial seller. In fact, Psycho-Cybernetics is a trailblazer. Although it doesn’t use these words as nouns, it covers topics like visualisation, flow state, meditation, and mindfulness long before they were in the mainstream. First written in 1960 Psycho-Cybernetics has maintained bestseller status and has remained in print almost sixty years later. According to its Wikipedia entry, Psycho-Cybernetics inspired Tony Robbins and other well-known personal development experts in how they shaped their own approach. Maltz was clearly ahead of his time when he wrote this book and what’s more impressive is that he was 71 when the first edition was published. Forward-thinking books by men in their later years of life usually don’t happen. Especially ones written by those who are non-experts in the field of personal development and psychology. Maltz was, in fact, a plastic surgeon and it was through surgically correcting certain “freakish” features on people’s faces did he realise that their self-image would rise within a few weeks. Maltz was, in fact, a plastic surgeon and it was through his work he saw an increase in self-esteem of people who had “freakish” features on their faces surgically removed. And then there were people whose self-image remained the same despite being made aesthetically better looking. Maltz pioneered the idea of visualisation which is a common term in today’s world of self-development but back then the concept was unheard of. The principles he outlines in Psycho-Cybernetics have been recycled in other books with a slightly different name or spin on it, but ultimately this is the book in which it all stems from. Psycho-Cybernetics’ main premise is how we see and what we think of ourselves. Our self-image is the key to our personality and behaviour. Each of us has an idea of our own self-image although we may not give it much thought. Maltz says that it may be vague and ill-defined but it is there, complete down to the last detail. If you have a healthy self-image chances are you are successful. If not, then you may be living a wasted life. The problem is, Maltz says, is that our past experiences define our truth, but we can change it if we want to. It’s all to do with experiencing. Our self-image is developed by our past experiences and over time new experiences reinforce what we already believe. The unconscious mind can’t tell the difference between an actual experience and one developed in the mind. This is where visualisation in Psycho-Cybernetics comes in. Maltz says our subconscious mind operates like a servomechanism which is an engineering term to describe to a device which learns from negative feedback. Instead, he calls it the Creative Mechanism. It’s impersonal, he says. Present it with a success goal and it will function as a success mechanism. Present it with negative goals and it will function as a failure mechanism. To serve the Creative Mechanism it has to be fed with mental images we use to create by the use of imagination. It’s up to you what those mental images look like. Every living thing has an inbuilt guidance system helping it to achieve its goal. For animals other than humans the goal is survival and reproduction. That’s why a squirrel born in the spring knows how to save food for the winter or how a bird instinctively knows how to build a nest without being shown. This is their Success Mechanism at work. Humans share this same survival and reproduction goal but we also have greater emotional and spiritual needs to meet too. Psycho-Cybernetics says man’s Success Mechanism is more complex. It allows him to solve problems, invent, write, run a business, explore, develop a better personality and so on. Man has something animals don’t have: creative imagination, therefore, man can direct his Success Mechanism by the use of his imagination. To reiterate,Psycho-Cybernetics was written in 1960, long before anyone had heard of the visualisation and the Law of Attraction. It really was ahead of its time, especially when Maltz discusses how imagination is key to success. If you can see yourself doing it then you have more chance of succeeding than if you didn’t. This is ‘believe and you will achieve’ long before it was hip. Maltz makes the point that through experience you increase our chances of being successful. The key point being your nervous system cannot tell the difference between a real experience and imagined experience. In other words, imagination can provide as much success as the real experience. It turns out visualisation (or imagination as the book puts it) was practiced by prominent people for many centuries. Conrad Hilton imagined himself operating a hotel long before he ever bought one. Industrialist and inventor of modern-day ship building, Henry J Kaiser said each of his business accomplishments “was realised” before he had done them. Maltz says we are all hypnotised about certain beliefs we have about ourselves. If you have an accepted negative belief about yourself, given either from yourself, your teachers, your parents, from advertisements or any other source and you firmly believe it, you have been hypnotised. Everyone is hypnotised to some extent, either by uncritically accepted ideas by others or by ideas you have convinced yourself are true. Negative ideas have a negative effect on behaviour, therefore, you have to de-hypnotise yourself from them. You have to change these ingrained beliefs by questioning where they came from. Once you begin to consider where they came you can rationally disregard them. Rational thinking is a powerful tool if we use it more often. The problem for most people is they don’t. Instead, they have preconceived beliefs about themselves which come from others or are based on no logic at all. Conscious rational thoughts allow you to power the unconscious mind with positive and realistic affirmations. Maltz says it’s the conscious mind that is the “control knob” of the unconscious machine. Most people hold on to previous errors, mistakes and failures in the unconsciousness mind for too long. We should learn from them but not give them more time than they deserve. This is where rational thinking can help remove any previous negative emotions in the unconscious mind. To be effective in doing this, rational thought must be accompanied with a deep feeling and desire. Imagine what you want and arouse a feeling of desire for those things. Become enthusiastic about them. Dwell on them and let them keep going over your mind. By doing this, you generate so much positive emotion on the new beliefs you eradicate the old negative ones. I often find that when I learn new information I have to take some time out to allow that information go from my conscious mind to the unconscious. Deep learning of any subject takes time. Maltz says man’s problem is he tries to solve problems with his conscious mind but conscious effort inhibits the automatic Creative Mechanism. The brain has to be relaxed before problems solving takes place. Famous people throughout history used relaxation as a means to find the solution to problems. I wasn’t sure what I was going to make of this chapter before I read it. I’ve already written about how happiness shouldn’t be the default state. Contentedness, yes but happiness, no. Thankfully, Maltz’s definition of happiness isn’t the all-singing and all-dancing kind often seen so much today, but more along the lines of my definition. Instead, happiness is a mindset, a habit and a choice to be in, in the present moment. It’s a mental habit, a mental practice and if it’s not learned and practised in the present, it’s never experienced. Learning the happiness habit you become a master instead of a slave. Maltz says we need to form the habit of acting aggressively and positively towards threats and problems, and we do this by forming a positive aggressive attitude toward both in actual everyday situations and also in the imagination. To be successful we need a sense of direction. We have to be moving toward something otherwise we’ll feel stuck. From my own personal experience, I know this is the case. Rarely am I not moving towards some kind of goal, but when I’m not a sense of frustration comes over me because I lack purpose. Maltz says ‘success’ is an acronym on how to have a successful type personality. Maltz says, functionally man is like a bicycle. It maintains its poise and a sense of equilibrium as long as it keeps going forwards and towards something. You base understanding on good communication. You cannot react appropriately if the information you act upon is faulty of misunderstood. Don’t come fuse fact with opinion, and be willing to see the truth. Successful personalities have an interest and regard for other people. They have a respect for other’s problems and needs. The biggest secret of self-esteem is appreciating other people more. Confidence is built upon a series and experience of successes. Success breeds success. Coming to terms with ourselves now, just as we are, with all our faults, weaknesses, shortcomings, errors, as well as our assets and strengths. Pressure gauges show warning signs and roads have signposts that warn of danger. It’s important to recognise that ‘negative feedback’ signs are good to have. The human body has its own negative feedback and red light signals much like pressure gauges and dangerous roads. These are in the form of symptoms or syndromes. We often think these symptoms and syndromes as a malevolent when in reality they can help you take action. Maltz uses another acronym using the word FAILURE. Frustration is an emotional feeling which develops whenever some important goal cannot be realised. Chronic frustration usually means that the goals we have set for ourselves are usually unrealistic or the image we have for ourselves is unrealistic. This is based on inner inadequacy. Man is a goal-striving mechanism and has to be moving forward towards something. When you think of yourself of having attained the goal or have no goal at all insecurity sets in. Uncertainty in everything we do is normal. Sometimes we freeze up due to lack of uncertainty. With this lack of movement and pushing forward, we get stuck. Self-esteem plays a role and we often become indecisive because we fear to be wrong. “Resentment, even when based on real injustices and wrongs, is not the way to win. It soon becomes an emotional habit. Habitually feeling you’re a victim of injustice, you begin to picture yourself in the role of a victimised person.” Resentment is caused by your own emotional response, your own action, and you alone have the power over this. Emptiness is losing the capacity to enjoy. He who has the capacity to enjoy basic and simple things can also enjoy success in the material but it is not the foundation for his happiness. The ’empty’ person who cannot enjoy in anything is dead. No goal is worth working for. Life is a terrible bore. We form emotional and spiritual scars for self-protection. Maltz says emotional scars have an adverse effect on the self-image and how people view the world around them. The world and people are hostile to them. He outlines three rules of immunisation against emotional hurts. People with a healthy self-image do not bruise easily. Self-esteem is as necessary to the spirit as food is to the body. The feedback mechanism shouldn’t be overly sensitive, however. Sometimes people are too inhibited when receiving feedback in an exchange and clam up. On the other end of the spectrum, some people don’t notice it at all. If you suffer inhibition you have got to practice greater disinhibition. In short, I’m unsure I need to read another self-development book again. Perhaps Psycho-Cybernetics is the only book of this kind anyone needs. It covers everything you need to know about mindset and how to see the world. Visualisation, flow state, meditation, mindfulness, happiness, success principles, self-reliance, spirituality are all key concepts in the book, although he doesn’t use these names. Look at all the modern-day self-development books and you’ll find there is a lot of overlap between this book and them. Sure, they might elaborate on a particular area further or indeed dedicated a whole book to a specific it (happiness as a topic is common in our day and age) or even provide a modern twist but they aren’t saying anything new, different or revolutionary than what Psycho-Cybernetics did almost 60 years ago. Learn the contents of this book and you pretty much have everything covered from a psychology perspective. Many of techniques in this book, while novel at the time and with little scientific understanding, have since gone on to be proven by modern day neuroscience. I got this book on Kindle but I intend on buying the paperback version too. I buy hard copy versions for books I intend to keep and continue to read for a long time.